This story was updated at 1:15 p.m. EDT. Apiece of Chinese space junk expected to zoom by the International Space StationThursday will pass harmlessly by, NASA officials saidafter scrambling to determine whether the six people aboard the outpost wouldhave to take shelter in their Russian lifeboats as a precaution. Thespacedebris threat is part of the defunct Fengyun 1C weather satellite that wasintentionally destroyed by China in a 2007 anti-satellite test. The debris willmake its closest pass by the space station today at 1:47 p.m. EDT (1747 GMT),but won't come any closer than 5 miles (8 km), NASA said in an update. Earliertoday, Mission Control had alerted the space station crew that the Chinesespace junk posed a potential threat, one that could force the astronauts and cosmonautsto wait out the debris pass inside the two three-person Soyuz spacecraft dockedat the space station. But about an hour before the expected debris flyby,Mission Control radioed good news to the station crew. "Allthree of our tracking passes show a consistent green miss distance, so at thistime we think there is no probability of conjunction and we are not going to besheltering in place," Mission Control told the space station crew. "Okay,we understand, Houston," the station crew replied. NASAtypically moves the space station if the odds of a space junk impact are withina 1-in-10,000 chance and there is sufficient time to plan a debris avoidance maneuver. Theagency also prefers to keep a pizza box-like buffer around the station free ofany debris. That safety zone extends about 15 miles (25 km) around the spacestation, as well as about a half-mile (0.75 km) above and below it. The stationflies in an orbit about 220 miles (354 km) above Earth. NASAspacejunk experts have been tracking the Chinese satellite remnant this week andinitially found that it posed no threat to the station, agency spokespersonKelly Humphries told SPACE.com from the Johnson Space Center in Houston. Afterfurther analysis, the uncertainty in the object's orbit prompted flightcontrollers to alert the station astronauts that they may need to take shelter. "This has been a hard object to get a precise fix on," Humphriessaid. Thespace station is home to six people. Three are American astronauts with NASAand three are cosmonauts representing Russia's Federal Space Agency. They arrived in two teams of three people each on the Russian Soyuz spacecraft, which remain docked at the station throughout their mission. Spacejunk has been a growing concern for satellites and astronaut-carryingspacecraft in orbit. NASA keeps close watch on any pieces of debris that mayfly close enough to the space station to pose an impact risk and endanger itscrew. NASAworks with the U.S. military's Space Surveillance Network to track potentially dangerousspace debris flying in low-Earth orbit. 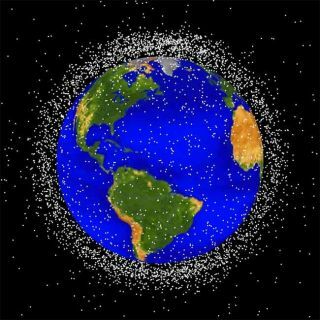 To date, there are more than 21,000pieces of space junk that are tracked in Earth orbit by the SSN, though a NASAdocument states that up to 500,000 pieces of debris are currently circling theplanet. Thelast time astronauts sought refugefrom space debris in their Soyuz spacecraft was in March, when a smallpiece from an old satellite rocket motor flew within 2.4 miles (4 km) of thespace station. That debris also did not impact the space station.